Class is 45 minutes and capped 12 people per class. Introduction to high intensity, constantly varied, functional movements. Basic strength work through dumbbells, kettlebells, medicine balls, and bodyweight movements. Gets you ready for Crossfit On Ramp. Class is 60 minutes long and capped at 12 people per class. Workouts focus on strength, conditioning and mobility. Crossfit uses different equipment; barbells, dumbbells, kettlebells, bodyweight movements and rack. Movements can be tailored to your needs. Athlete is required to take On-Ramp. This course is required for anyone who wants to do CrossFit and has not completed a similar course at another CrossFit affiliate. Both performance and safety are a top priority and we want you all to have a solid foundation. On Ramp is 4 sessions over one week. Each class will be a 1-hour introduces key skills. This introductory course is run per demand. 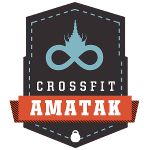 please email to strong@crossfitamatak.com for further information.